This combination of history and criticism tells of the haiku, one of poetry’s most simple and beloved forms. Sato gives a complete picture of the form’s journey and significance. Who doesn’t love haiku? It is not only America’s most popular cultural import from Japan but also our most popular poetic form: instantly recognizable, more mobile than a sonnet, and loved for its simplicity and compression, as well as for its ease of composition. Haiku is an ancient literary form seemingly made for the Twittersphere—Jack Kerouac and Langston Hughes wrote them, Ezra Pound and the Imagists were inspired by them, first-grade students across the country still learn to write them. But what really is a haiku? Where does the form come from? Who were the Japanese poets who originated them? And how has their work been translated into English over the years? The haiku form comes down to us today as a cliché: a three-line poem of 5-7-5 syllables. And yet its story is actually much more colorful and multifaceted. And of course to write a good one can be as difficult as writing a Homeric epic—or it can materialize in an instant of epic inspiration. 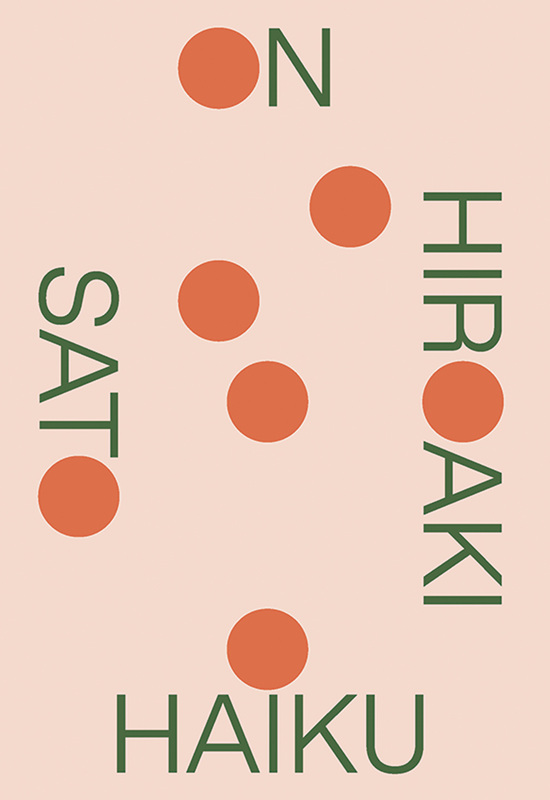 In On Haiku, Hiroaki Sato explores the many styles and genres of haiku on both sides of the Pacific, from the classical haiku of Basho, Issa, and Zen monks, to modern haiku about swimsuits and atomic bombs, and to the haiku of famous American writers such as J. D. Salinger and Allen Ginsburg. As if conversing over beers in a favorite pub, Sato explains everything you want to know about the haiku in this endearing and pleasurable book, destined to be a classic. Sato’s extraordinary collection of essays is at once a literary history, a scrupulous examination of the vicissitudes of translation, a discussion of haiku in America, and a series of introductions to lesser- known masters. Sato conveys encyclopedic knowledge in a lively, modest, occasionally self-deprecating tone, busting myths along the way. An expert illumination of a poetic form, to read and reread.